It's dark again. Friday, when I came in to work, it wasn't. It's a ripoff and a scam, and I won't stand for it. So, I'll sit. Meh, it's like getting to watch the season change again. This weekend was fraught with lovely weather, the kind that entices and seduces and falls on its glorious knees begging you to come away with it. So I spent as much time as my pale sack of flesh would tolerate out-of-doors. It wasn't exactly warm by normal standards, but 48 is downright balmy after you get acclimated to 12 and below. I went wogging this morning, and it was an adventure. The warmth of the weekend melted lots of snow, but the cold that comes with nightfall turned the runoff into a thin & crispy crust glazing over the asphalt. In the dark, it's tough to see the difference between black pavement and black ice. I expected to do the instysplits at every moment, and only let my guard down under streetlights, where it was plain to see whether I was on dry land. 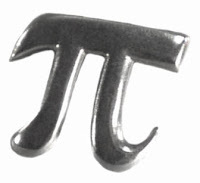 This coming Wednesday is Pi Day, as the numeric date is... well, if you don't know already, you're not geek enough to appreciate it. This PSA is brought to you so you have time to set up the catering and buy the booze. Leave party invitations in the comments, I'll come to each of your celebrations. Time to Earn My Keep, which means that this morning I have an actual deadline and better do something or join the Former Employees Club (there actually is one, they meet monthly at a local pub. There's a Future Former Employees Club too, we go out for lunch on Fridays).